These are valid Boolean relations and represent the binary product of bits (binary digits) 0 and 1. Generally, various English alphabets are used to represent binary 1s and the same alphabets, added with some special identification marks, are used to represent binary 0s. For example, if 1 is represented by letters a, b, x, y, etc., then 0 may be represented by characters a¢, b¢, etc. Bit 0 is usually called as the complement of bit 1, and vice versa. In this text, we will be mainly using symbols of the form a¢, y¢, etc. to represent complementary variables. The truth table related to the AND function is shown in Table Using the entries in this table, we test the validity of the AND expression given by Eq. (2). It can be seen that the entries in Table are the same as those given in Eq. (3). Using the circuit shown in Fig., we now prove the relations given in Table. In Fig., we find that switches A and B and a resistor R are connected in series with a DC power supply of +V volts. Assuming positive-logic operation, let 0 represent an open or OFF switch and 1 represent a closed or ON switch. Combining all the conditions given above, we find that the switching circuit shown in Fig. performs the logic AND operation. 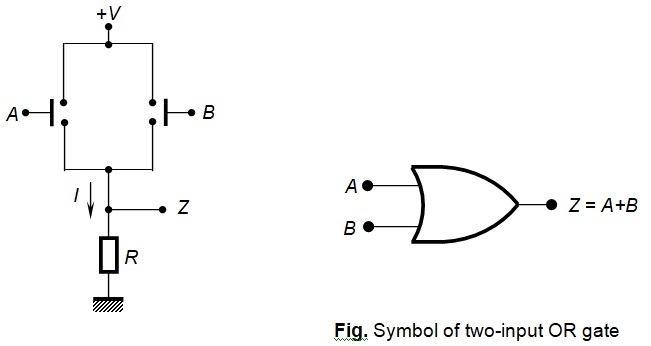 Figure shows the logic symbol of the two-input AND gate. It can be seen that the relations given above are valid summing relations in the binary number system. Hence we may say that the statement Z = A OR B may also be stated as Z = A plus B. The truth table of the OR function is shown in Table. It can be seen that the entries of Table are the same as those given in Eq. (5). Figure shows an OR gate using two switches A and B connected in parallel to each other. A resistive load R and a DC power supply +V are connected in series with this parallel combination. Current I flows through R and develops a voltage drop of +V volts across it when either A or B or both are closed. These three conditions may be expressed in the form: Z = 1, when A = 0, B = 1, or A = 1, B = 0, or A = B = 1. If both the switches are open, then no current will flow through the load, and hence the output voltage Z = 0 volt = logic 0. This represents a positive-logic OR operation. Figure shows the logic symbol of the two-input OR gate. The NOT (negation) operation is characterized by an inverting operation. If a given function A represents a closed switch, then NOT of A represents an open switch and vice versa. The function NOT of A may be represented symbolically. Figure shows a mechanical switch connected in series to a resistor R and a DC supply voltage of +V volts. Whenever switch A is open (i.e., A ≡ 0), no current (I) flows through R. Then, output Z = +V (≡ 1). Thus when input A = 0, we find that output = 1 = A′. Now, if A is closed ( ≡ 1), t I will flow through R and switch A. Since A is closed, it will act as a dead short across the output terminals making Z = 0 volt ≡ 0 = A′. Thus we find that the circuit shown in Fig. performs the NOT operation. The truth table of the NOT gate is shown in Table and its logic symbol is shown in Fig. The bubble (small circle) at the tip of the triangle represents a negation (inverting) operation. This table describes the operation of a NAND gate. NAND operation is obtained by combining an AND gate in series with a NOT gate. It can be seen that the NOT gate inverts the outputs of the AND gate to yield the NAND (NOT of AND) function. The NAND function is generally denoted as (AB)′, where the apostrophe symbol (′) denotes a negation, inversion, or complementing operation. Figure shows a NAND gate constructed using mechanical switches. It can be seen that this circuit is a modification of the AND circuit shown in Fig. In the AND gate, resistor R is connected below the switches. Since NAND is an inversion of AND, the position of R is inverted, i.e., it is moved to the position above the switches. Logic symbol of the NAND is shown in Fig. The working of the circuit shown in Fig. can be described as follows. Let initially, A and B be open. This means A = B = 0. In this condition, no current will flow through the circuit and hence I = 0. This makes output Z = +V ≡ logic 1. The same condition, viz., I = 0 and Z = +V ≡ logic 1, prevails even when A = 1 and B = 0, or A = 0 and B = 1. However, when A = B = 1, both the switches are closed and I flows through the circuit. It can be seen that in this condition, the output is shorted by the closed switches; hence Z = 0 volt ≡ logic 0. These actions represent a NAND operation. It may be observed that a NOT gate can be obtained by shorting all the input terminals of a NAND gate. Consider the OR truth table shown in Table. Let the entries in the third column of this table (representing output Z) be inverted (i.e., 1s changed to 0s and 0s changed to 1s), as shown. Table shows the truth table incorporating these changes. This table describes the operation of a NOR gate. NOR operation is obtained by combining an OR gate in series with a NOT gate. It can be seen that the NOT gate inverts the outputs of the OR gate to yield the NOR (NOT of OR) function. The NOR function is generally denoted as (A + B)′, where the apostrophe (′) denotes a negation, inversion or complementing operation. Figure shows a NOR gate constructed using mechanical switches. It can be seen that this circuit is a modification of the OR circuit shown in Fig. In the OR gate, resistor R is connected below the switches. Since NOR is an inversion of OR, the position of R is inverted, i.e., it is moved to the position above the switches. Logic symbol of the NOR is shown in Fig. The working of the circuit shown in Fig. can be described as follows. Let initially, A and B be open. This means A = B = 0. In this condition, no current will flow through the circuit and hence I = 0, and Z = +V ≡ logic 1. However, when A = 1 and B = 0, A = 0 and B = 1, or A = B = 1, I will flow through the circuit and Z = 0 volt ≡ logic 0, It can be seen that under these conditions, the output is shorted by the closed switch (or switches); hence Z = 0 volt ≡ logic 0. These actions represent a NOR operation. It may be noticed that a NOT gate can be obtained by shorting the input terminals of a NOR gate. It can be seen that two NAND gates connected in series will give us an AND gate. 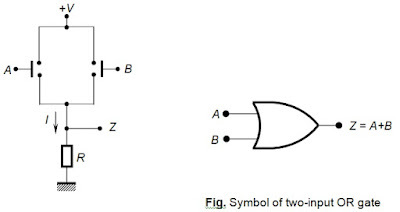 However, two AND gates connected in series can not produce a NAND gate. Similarly, two NOR gates connected in series will give us an OR gate. But, two OR gates connected in series can not produce a NOR gate. It may be noted in this context that a NOR operation can be converted to a NAND operation and vice versa. For such NAND-NOR conversions, we make use of a set of fundamental Boolean laws known as the De-Morgan’s laws. It can now be seen that complex logic expressions can be realized by interconnecting connecting NAND (or NOR) gates alone in series, in parallel, and in combined forms. Therefore, NAND gates and NOR gates are called as universal gates. where xi = x1, x2, …, xm represent the inputs to the switching network, and z is its output. Equation (1) can be treated as a logic function, when we define the inputs and their mutual logical relations to give the output z. It may be noted that xi’s and z assume only two values, viz., 0 and 1. A logic system can be tested for its performance by using what is called its truth table. In truth tables, entries are made using 0s and 1s. In practical circuit applications, a turned-on switch can be used to represent binary 0 and a turned-off switch can be used to represent binary 1, or vice versa. Combinations of these switches can be used to generate any desired logic function. Such functions, as stated above, are called switching functions. The basic switching functions are AND, OR, NOT, NAND, NOR, XOR and XNOR, respectively. Complex logic functions can be obtained by combinations of these basic functions. It may also be noticed that all the other functions can be generated by using NAND or NOR functions alone. ‒VCC and this may be treated as logic 0. When it is in the on state, the output of the transistor is at 0 volt, and this can be used to represent logic 1. This logic scheme is known as the negative-logic scheme. In this textbook, bold numbers 0 and 1 will be used to represent logic 0 and logic 1, respectively. where we have used a bold 1 to represent logic 1. Here, a positive transition from 0 volt to +V volts indicates the logic transition from bit 0 to bit 1. 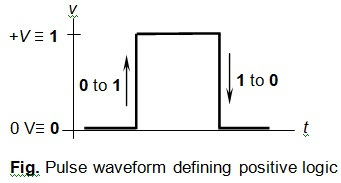 As stated earlier, NPN transistors can act as switches that perform positive-logic functions. 1. R more than metal conductors and less than insulators. 2. Negative temperature coefficient as R decreases with rise in temperature. 3. Electron valence of ±. This valence means the atom has four electrons in the outermost ring-halfway to the goal of 5. The special feature of the semi-conductor elements, however, is that the atomic structure allows their conductivity to be increased by adding impurity elements, a process called doping. The purpose is to increase the number of free charges that can be moved by an external applied voltage. When the number of free electrons is increased, the doped semi-conductor is negative or N type; reducing the number of free electrons makes the material P –type. Both germanium (Ge) and silicon (Si) can be used with either P-type or N-type doping, but silicon semi-conductor devices are most common. Take electrons to form P-type semi conductor, Ga and In used for Ge, Al, and B for Si. Used in pure crystal form to be doped with impurity elements. Doped semi conductors are extrinsic. Silicon and germanium have 5.0 × 10^28 and 4.42 × 10^28 atoms per m^3 respectively and an addition of only one impurity atom per 10^7 or 10^8 semi-conductor atoms is sufficient to yield the desired properties.